Found today in Coventry Street: a small silver ring. Can I say a big thank you to the snow clearers who took up their spades and broke through the ice in Hamilton Road after the first time it snowed this year? They cleared the pavement and enthusiastically dug out two channels in the road for cars. A visitor to the area singlehandedly broke through a path across the top of Hamilton and Stanford Road with the aid of a hammer, which was tremendous as previously it had become treacherous to cross there. Thanks also to Andy from the Prestonville Arms and Richard Freeman who gritted both pavements in Hamilton Road. It made a great difference to getting about safely this snowfall and it just so happened we could all get to the pub easily! Snow could fall in the city from this evening, with further showers until Friday and consequently the council gritters will be out treating all the main highways today and this evening. Street cleaners are being diverted today to pre-grit pavements and gritting bins are being refilled for residents to use. hilltops, outside hospitals and shop fronts. Four wheel drive vehicles will also be made available to ensure home care teams and Meals on Wheels are able to visit vulnerable people. 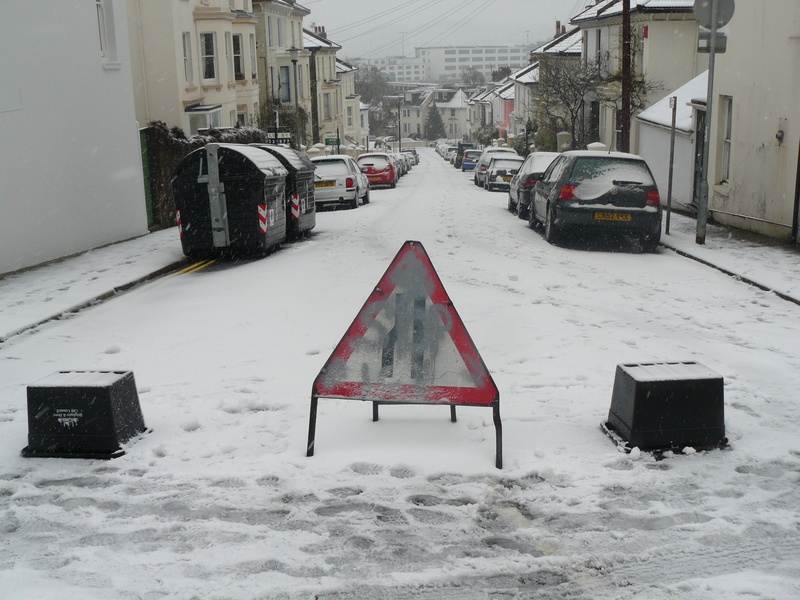 Full gritting routes across the city cover 156 miles, taking in every bus route in Brighton & Hove and there are 350 salt bins on pavements. In preparation, the council has around 400 tonnes of salt stored at Hollingdean depot. This would cope with almost three weeks of continuous heavy frosts. There is another 500 tonnes of salt on order. In the event of snow and ice tomorrow the council is prepared to place piles of grit at strategic locations using street cleaning and gardening staff. However, drivers and pedestrians should remain vigilant and take care during the cold snap as it is not possible to grit all 3,000 of the city’s roads. Even a high level of gritting service on roads and pavements that can be treated cannot guarantee they will always be completely clear of ice or snow. This can be for various reasons, including the time it takes for salt to become effective; salt being washed away if rain turns to snow and water leaks on roads that turn to ice in below zero temperatures. Drivers and pedestrians should be especially cautious when road frosts or freezing temperatures follow rain or snow.